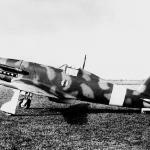 Giuseppe Gabrielli designed the Fiat G.50 Freccia and the first prototype (MM 334) flew on February 26, 1937. 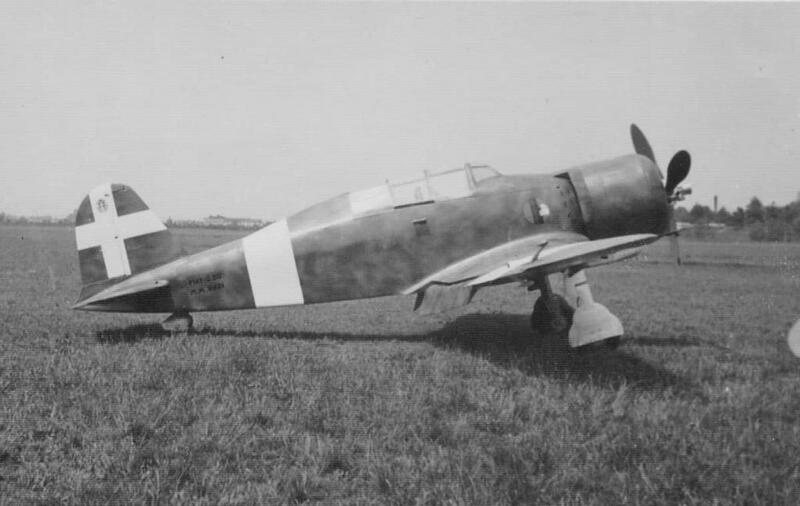 It was the first Italian single-seat monoplane fighter. The G.50 had an all-metal fuselage with a three-piece wing. The movable control surfaces were fabric covered, balanced and split flaps were fitted. A Fiat G.50 Freccia over the skies of Libya. Initial production consisted of 40 G.50s. In 938, Italy sent 12 Fiat G.50s to Spain for testing under operating conditions with the Gruppo Caccia Sperimentale (Experimental Fighter Group). The results were extremely successful and the Regia Aeronautica ordered an additional 200. Fiat made various changes in design, such as removing the sliding cockpit canopy, which pilots disliked. 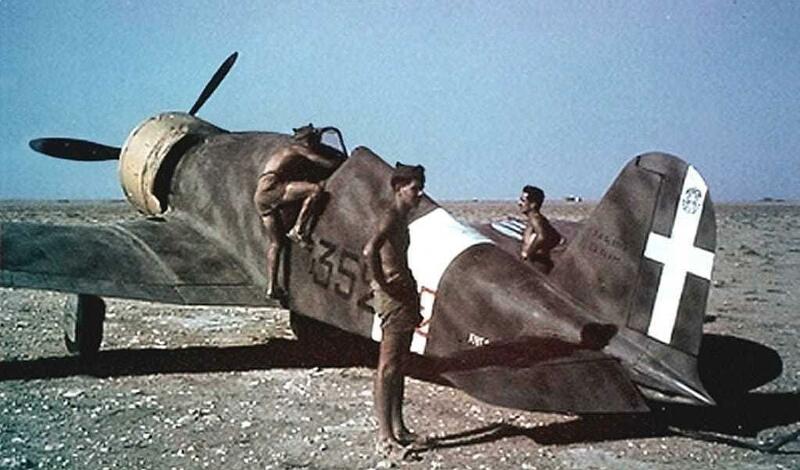 A color photograph of a Fiat G50 Freccia with the 352 Squadriglia in Libya, 1941. Other semi-enclosed cockpits were created until folding flaps on each side of the cockpit was adapted. In 1939, Finland ordered 35 G.50’s but were detained en route by Germany until 1940 after the cessation of hostilities between Finland and the USSR. The G.50’s served with the Finnish Air Force No.26 Squadron and continued frontline service until May of 1944. In addition, Spain obtained two pre-production models and the Croatian government obtained 10 G.50s. When Italy entered the war on June 10, 1940, 48 G.50’s of the 20th Gruppo Caccia Terrestre accompanied the Corpo Aero Italiano to Ursel, Belgium in October of 1940 for use in the Battle of Britain. There is, however, no record of any encountered actions over the British Isles. In October of 1940, the Fiat G.50 Freccia with the 2nd Gruppo Caccia Terrestre saw action over Greece and the Regia Aeronautica deployed the G.50bis over north Africa. 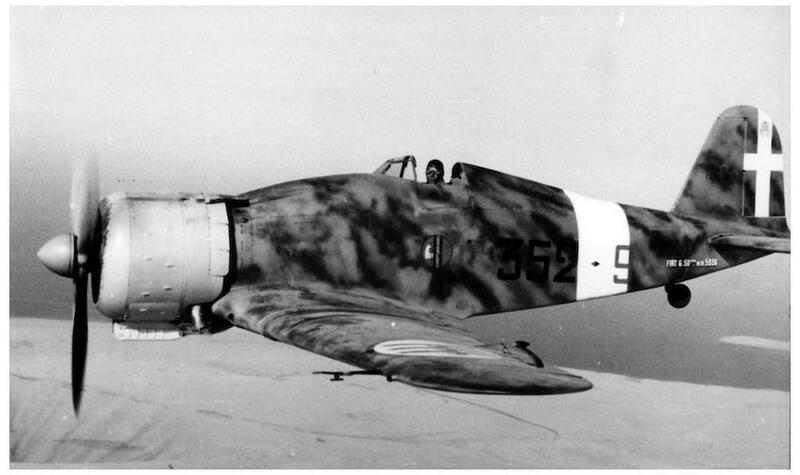 The fighter still possessed inadequate speed and firepower, forcing most pilots to prefer the Macchi C.200. Another color photograph of the Fiat G.50 Freccia in Libya. Fiat built the G.50B as a two-seater training version of the G.50. This version flew on April 30, 1940. Fiat built one hundred of these variants. On 9 September 1940, Fiat introduced the G.50bis variant. Some differences included removal of the 2.2 lb anti-personal or incendiary bomb and replacing it with an additional 27 gallon (104 liters) fuel tank. Other changes were the elimination of the tail wing fairing and redesigning the vertical tail surfaces. Another change was an increase in length from 26′ 4″ to 27′ 2 1/3″ and a reduction in height from 10′ 9″ to 9′ 2 1/4″. 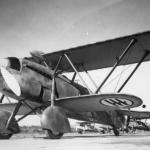 The G.50bis proved to be a good variant and Fiat built 450 of these aircraft. The Croatian Air Force obtained ten units. The Fiat G.50B is a two-seater version of the Freccia. Fiat made several attempts to modernize the G.50. Fiat built the G.50ter on 17 July 1940 and the power plant consisted of a 1,000 hp Fiat A.76 engine. It attained a maximum speed of 329 mph. On August 25, 1941, a new G.50V, converted to hold a German Daimler-Benz DB 601A 1,050 hp engine, attained a speed of 360 mph. The Fiat G.51 was the name of the production version of this aircraft. Fiat was also in the process of making a newer aircraft named the G.52, but that was later dropped for the G.55 Centauro. A G.50 over the Mediterranean. Fiat developed a final two-seater G.50bis/A fighter-bomber variant on 03 October 1942. Additions included a 12.7mm Breda-SAFAT machine gun in each wing and shackles for a pair of 353 lb bombs. Fiat added arrester hooks for use on the anticipated aircraft carriers Aquila and Sparviero, still under construction. 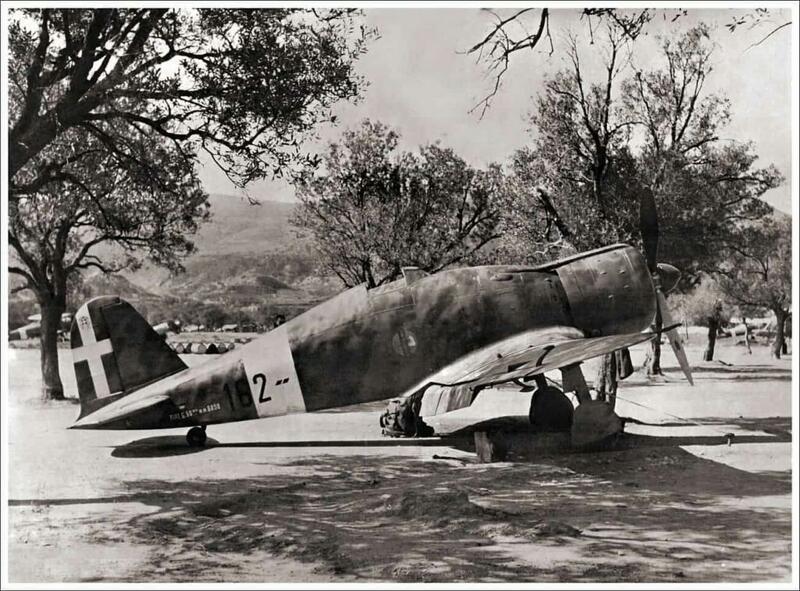 A Fiat G50 Freccia from the 162 Squadriglia in Rhodes Greece. Image taken in January 1942.